New Pig oil-only absorbent mat roll. Brown color blends in with most environments for both indoor and outdoor use; hides grime, so mat stays on the job longer. Eight layers of 100 percent polypropylene are thermally bonded to make Pig Mat the strongest mat on the market; won't rip, tear or fray even when saturated. Exclusive dimple pattern speeds wicking of liquid throughout mat for faster, easier cleanup. Highly absorbent, fine-fiber construction won't leave behind liquids or fiber residue. Absorbs and retains oils and oil-based liquids - including lubricants and fuels - without taking in a drop of water. Floats to clean up spills on water. Can be wrung out and incinerated after use to reduce waste or for fuels blending. Flame-resistant material won't burn immediately like cellulose mats; melts when exposed to high heat while on the job. 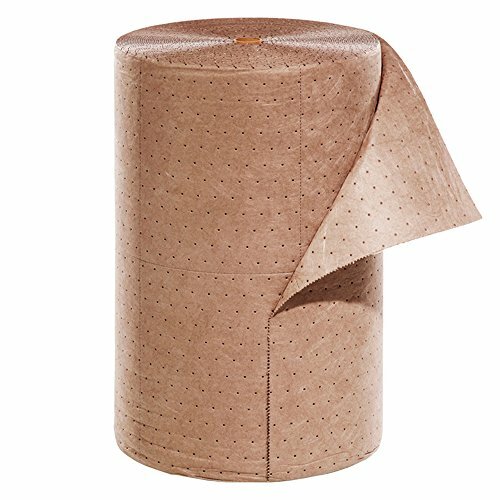 Rolls are ideal for covering large areas and soaking up leaks and overspray. Easy-tear perforations let you take only what you need, so you use less mat and save money. Light-weight construction is economical for small tasks and cleanups. Perforated every 10-inches lengthwise and centered widthwise. Up to 32.4 gallon absorbency per bag. Measures 300-feet length by 24-inches width. Brown color. View More In Oil Cleanup Absorbers.